Our counselors meet with clients in one-on-one sessions to explore the roots of their addiction and develop coping mechanisms to handle both new and ongoing stressors. We also work with family members to explore solutions for interpersonal conflict and craft a team approach to handling the frustrations of day-to-day life. Our Case Management program builds a framework of support that encompasses all challenges in a client’s life: employment, education, home and family life, transportation, healthcare, and childcare. Working towards a substance-free lifestyle requires a coordinated effort with constant support, and we use goal-setting service plans to break these challenges into manageable tasks. Our Group Counseling program helps our clients find additional support and empowerment as they work towards achieving their treatment objectives. The teamwork and camaraderie of a group setting helps to explore the root causes of addiction and the ramifications of acting on those impulses. 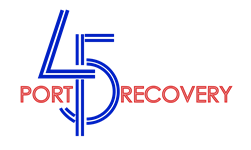 Port 45 Recovery works with the community to provide prevention support for youth and their families, using compelling evidence to discourage initial drug and alcohol use. Ongoing support for families undergoing dramatic transitions allows our skilled professionals to prevent the first steps towards substance abuse. If a client’s lifestyle poses immediate danger to themselves or their families, Port 45 is equipped to intervene and provide a safe space for future treatments. As an ongoing service to our clients and the community, we offer drug screening through a local laboratory that provides comprehensive tests.